Skype is a kind of a software application that gives you a chance to communicate with another person over the internet. However, this software application does not have the capabilities of recording conversations in either audio or video. 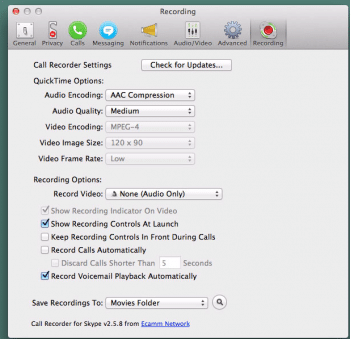 Well, the introduction of the best Skype recorder on Mac has made it possible for many users to record their conversations that are both in audio and video format. 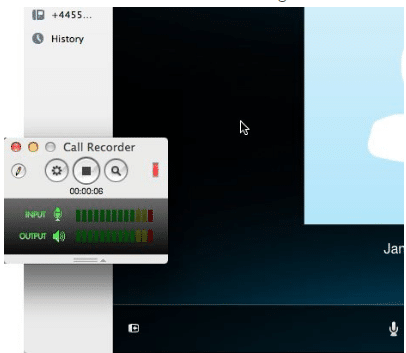 Ecamm call recorder is a seamless addition to Skype that provides a number of configurations that help in recording of calls that are both in audio and video. This is one of the best recording applications that are used in interviews, lessons and podcast. You can be able to improve the iSight camera on your Mac as well as being able to search and retrace lost pictures. You can run interviews with individuals around the globe for free and be able to later track the audio levels. This is very convenient. You can be able to monitor and back up every call that you make and also be able to save the calls for later review. You can be able to share content e.g. presentations during Skype video or audio calls. Meeting controls are available on this software application. The only difference is that accessing can be a little bit harder in this case. There is no integrated survey when it comes to this application but a separate online survey tool can be used in this case. Currently, uploading files on the Ecamm server so as to share with another end user is impossible. But if the videos or files are uploaded on the web, other end users can be able to open and view without any issues. Once you have successfully downloaded and installed your software, your Skype will now get a new Preferences settings by the name Recording. 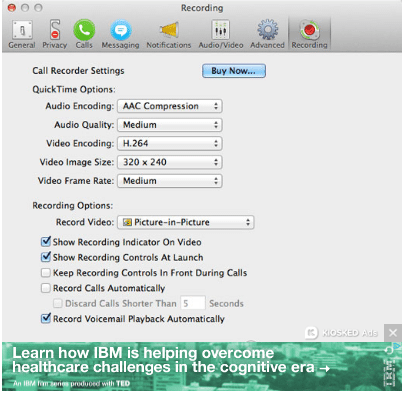 Choose the QuickTime settings for your Call Recorder. The best thing is to leave your settings at default but still you can access them through Skype-Preferences-Recording. Go to your Skype and start your call. At this stage, the Call Recorder will appear on a new window in your Skype. On your Call Recorder, click the Red button to start recording. After a successful call, go to your Call Recorder, click the Stop button to finish your recording. Now go to the Search icon in your tool and access the Finder folder containing your recordings. Mostly, the recordings are located in Movies/Saved Calls by default. That’s how easy it is to use Ecamm Skype recorder. The best thing is that it integrates itself to the Skype app. Downside of it, you will have to pay to use it regularly. Go to Skype preferences and click the Recording tab. On the options, you can see different settings like the recording format and also the quality. There is much you can do here like choosing to capture only the audio and video. You can also select where to save your recordings automatically. There may be occasions where you might need to record Skype conversations and video calls either for personal reference or business reference. If you are looking for a simple yet effective recorder to record your audio and video calls, I suggest that you go for the Ecamm call recorder. All that you will need to do is to install the recorder in your system and whenever you receive or make a call, you can get to record it. This software will routinely record your audio and video conversations and get to save them on the hard drive.